The AceGrip Lite General Purpose Latex Gloves are tough, general purpose gloves suitable for an extensive variety of applications.The premium black crinkle latex coating on the AceGrip Lite General Purpose Latex Gloves provides excellent grip and durability. The seamless 13 gauge red knitted polyester liner of the AceGrip Lite General Purpose Latex Gloves are lightweight, soft and extremely comfortable for the wearer over prolonged periods of use. The AceGrip Lite General Purpose Latex Gloves are also available for purchase in case quantity. 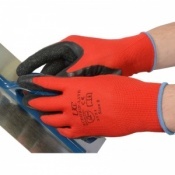 The AceGrip Lite General Purpose Latex Gloves have been sized according to EN 420, which governs a range of features about gloves including standardised sizing. Please measure the circumference and length of your hand and see below for the size of glove that is necessary. 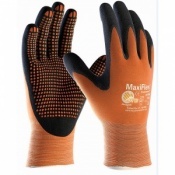 Five sizes of these gloves are available. I'm a window cleaning who uses the pure water reach system. These gloves have proved an excellent buy, assisting with my grip when holding the pole at high heights and maintaining grip even when pole is wet. Very good quality with prompt delivery, I will be reordering when these wear out. Can still feel what you are doing and therefore good work gloves. Good gloves at a reasonable price.